In June 2010 a young female orca, now named Morgan, was found in an emaciated condition off the coast of the Netherlands. She was captured by the Dolfinarium Harderwijk for ‘rehabilitation and release’. Unfortunately, after more than a year, the Dolfinarium has yet to release Morgan and now refuses to do so. Dr Ingrid Visser has just returned to New Zealand after spending more than a month helping to prepare documentation for a court case against the Dutch Government and the Dolfinarium. The Judge ruled that the Ministry must now do due diligence and investigate the case properly and that the Dolfinarium cannot export Morgan to Spain, where she would be forced into permanent captivity with a group of orca belonging to SeaWorld. 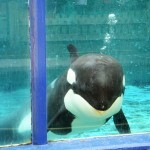 SeaWorld wants to breed from Morgan as their orca are inbred to the point where they are letting mothers breed with sons.